Who killed Mister Boddy? Where did they do it? What was the murder weapon? Odds are, you’ve probably played the mystery board game Cluedo (or Clue, in some countries). In the game, your character runs around a mansion as fast as your dice rolls will let you, asking the other players if you can see their lead pipe in the billiard room. If you haven’t, get off your Xbox and make some friends. 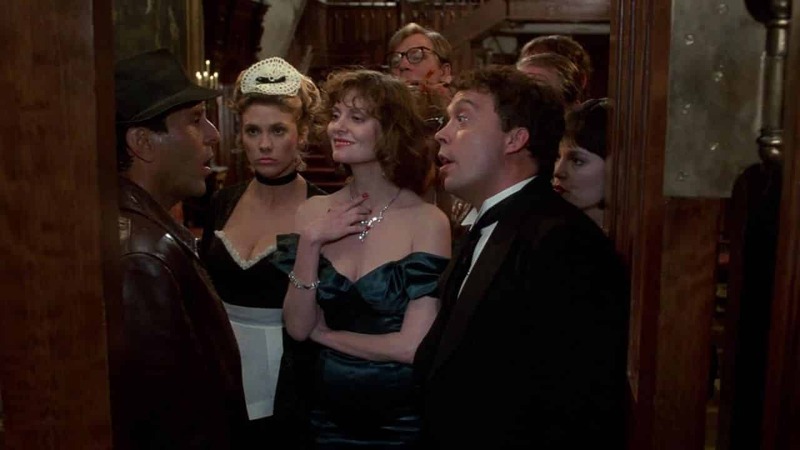 But back in 1985, John Landis and Jonathan Lynn had the quirky idea of adapting the game into a comedy/mystery movie… and it unfairly got shot down by the critics at the time. That may not be too surprising. Look at all the other board game movies out there like Battleship and Dungeons & Dragons. If you think video game movies have it rough, board games don’t exactly have a stellar track record either… and this is even without the long-awaited Monopoly movie. The difference here is that Clue is, quite simply, a brilliant farce and a genuinely funny film. …And it’s Mr Boddy’s body! None of the guests mind, since he was a horrible guy anyway. But when Wadsworth informs them that the police will be arriving shortly, they realise that they’re on a time limit to find out which of them is the actual murderer. The clues are plentiful, some obvious and some hidden in plain sight, but many seem contradictory. A check of the house reveals that the cook has been killed too, although dinner wasn’t that bad. Or was it? When a stranded motorist arrives needing to use the phone, he’s killed too… apparently, because he knows too much about one of the guests. With the body count rising, too many corpses in the lounge for anyone to sit comfortably on the sofa and time running out, the guests split into pairs to search the mansion and hopefully identify the killer. Instead, they find secret passages and all-new troubles, as the weapons are being used with deadly efficiency every time the lights go out. So which of them is the killer and why? Thankfully Wadsworth has been paying attention and engages in the most manic Poirot-style explanation you’ve ever seen. This is where the film’s real ace-in-the-hole pays off… and it’s probably also one of the things that annoyed critics and viewers upon release. Like in the game, the murderer could be anyone. When the film was originally released on circuit, different prints were distributed – each one featuring one of three different endings, so you never really knew what you were going to get when you watched it. Thankfully, on the DVD release viewers get to choose an ending at random, or go for the video release option which was to show all three – one after the other – in a neat what if? format… the last one being the “real” solution. If all of this sounds a bit cut-and-dry, it isn’t. 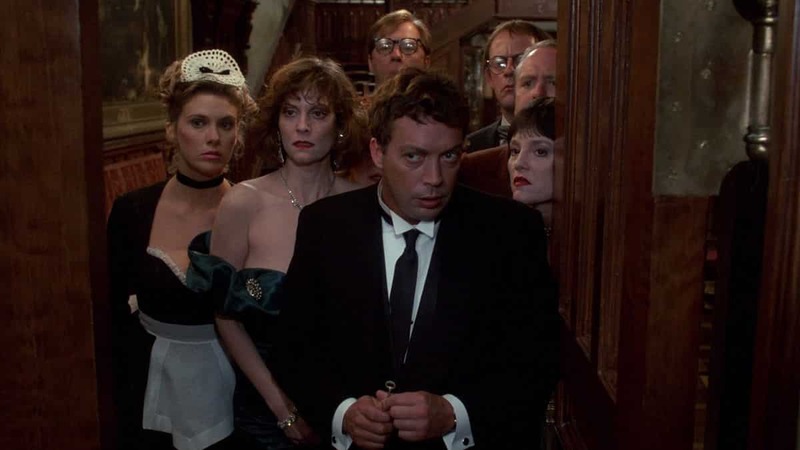 Clue moves at a frantic pace once it gets going, and is smarter than it lets on. It takes multiple viewings to soak in all of the clues and jokes, which work on increasingly deeper levels the more you understand it all, leading to a new appreciation and catchphrases that are unforgettable. And it is a comedy, as mad as it may seem. The jokes range from basic slapstick to some of the wittiest jokes you’ll ever hear. Are Miss Scarlet’s comments about Kipling just a misunderstanding that it’s not a food, or a veiled reference to her career? When Mrs White is asked how many husbands she’s had, she asks if they mean hers or other women’s. The wordplay in this film is simply brilliant, especially because it’s played straight and kept ambiguous. Tim Curry’s performance here is almost as iconic as Frank N. Furter in Rocky Horror, and it’s another outstanding display from him. The late, great Madeline Kahn is in prime form, truly giving one of the best performances of her entire career. Spinal Tap’s Michael McKean is fantastic as the neurotic Mr. Green, constantly babbling on about how he didn’t do it, while Back to the Future’s Christopher Lloyd as the lecherous Professor Plum and Eileen Brennan as the corrupt Mrs Peacock are a perfect fit. 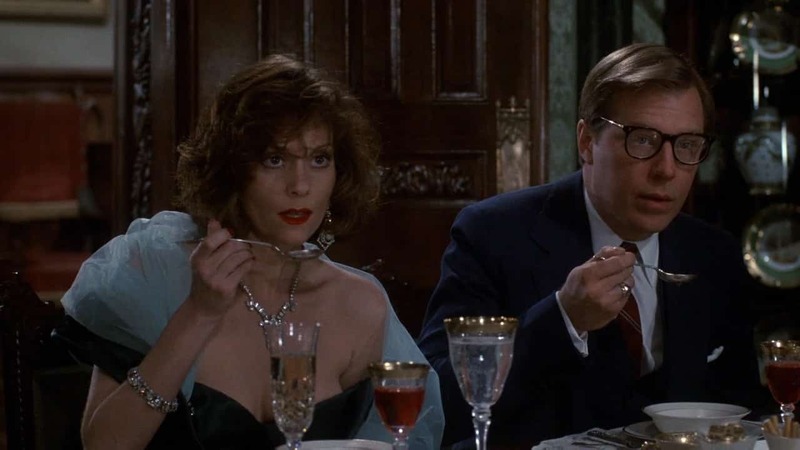 If you’ve never seen Clue before, you’re missing out on a film that’s simultaneously a smart murder mystery and a hilariously dark comedy. It may seem like an odd combination, and it may not work for everyone, but it’s a film that’s even better now than it was then. It’s a work of inspired genius and a modern cult classic that really deserved far, far better. So give Clue a whirl, and just remember that it’s one plus one plus two plus one, not one plus two plus one plus one.